Jonathan Rea made it 59 career World Superbike wins at Imola in Italy on Sunday. Jonathan Rea hailed his Sunday performance as the ‘best of the season’ as the Kawasaki rider completed a double at Imola in Italy to equal Carl Fogarty’s record of 59 World Superbike victories. Rea faced an uphill task as he started the race from ninth place on row three due to the reverse grid rules, but the Northern Ireland rider had moved up to second place behind Ducati’s Chaz Davies after four laps. World Superbike champion Jonathan Rea celebrates at Imola. The reigning champion sat behind Davies for a few laps before attempting to make a pass as the pair became embroiled in a due at the front. On lap 13, Rea slid underneath Davis at Variante Alta and put in two hot laps on the Ninja ZX-10RR to break clear of the Welsh rider, eventually going on to win comfortably by four seconds. It was the 31-year-old's first double of the season and the 17th of his career – a new World Superbike record. Rea said: “We got it done and it was probably the best race win of the season. Coming from ninth on the grid, it was so difficult. Rea now leads the championship by 47 points from Davies after the first five rounds. Tom Sykes (Kawasaki Racing Team) finished third ahead of Xavi Fores (Barni Ducati), Jordi Torres (MV Agusta) and Alex Lowes (PATA Yamaha). Eugene Laverty, back in action for the first time since he suffered a broken pelvis in Thailand in March, was ninth on the Milwaukee Aprilia. Marco Melandri (Aruba.it Ducati) and Michael van der Mark (PATA Yamaha ), who had been battling for the final podium place, came together on lap 10 around Rivazza. The pair collided and ended up in the gravel. 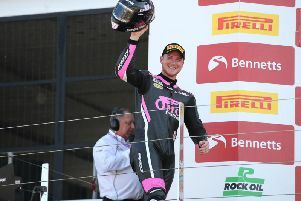 In the World Supersport Championship, Carrick’s Andrew Irwin finished in the points again on the CIA Landlord Insurance Honda on his debut at Imola.